Were there 22,225 personal buyers, Uber drivers, and FBI field offices who absolutely needed a full-size General Motors SUV in May 2014? Probably not. But 22,225 were sold anyway. And that figure doesn't even take into account buyers of GM's Lambda-platform crossovers - Acadia, Enclave, Traverse - or Cadillac's Escalade and Escalade ESV. I remember a few months back seeing press releases from GM when they first showed these new brutes, proclaiming in basic terms that they stay in the category because they dominate the category. I double checked their market share tallies, and... uh... yeah, the numbers backed up GM's claims, and we all already knew that. So today, after reading Andrew Collins' review of the new Suburban on Truck Yeah! - yeah! - I once again dove into the full-size SUV numbers to see if GM, with the new models coming on stream, managed to continue their outright dominance of the category despite the emphasis they're placing on high-end models. Ford is clearing out the 2014 Expedition in advance of the somewhat updated, EcoBoost-only, 2015 Expedition, after all. Sure, I should know the numbers off by heart. This is all I do. Every day. But the numbers start to look the same, and after those first couple days of a month, I can't readily bring up the figures for every full-size SUV on the back of my eyelids. The results? (They're available in full in this GCBC post from last Wednesday.) Yes, 75.5% of the market for these SUVs went GM's way. That's actually down from 76.1% a year ago, when the Yukon XL achieved a total twice as high as its otherwise average output in 2013. More to the point, it's so normal. This is just what GM does best. Month in, month out, recalls aside, new CEO or old CEO, bankruptcy or boom time, GM controls this highly profitable segment. 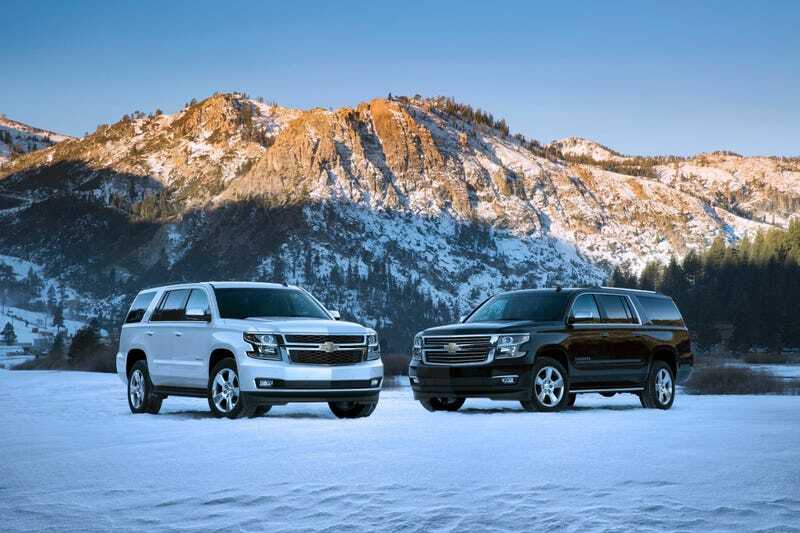 29,422 Suburbans, Tahoes, Yukons, Yukon XLs, Expeditions, Armadas, and Sequoias were sold in America in May 2014. Perspective? 48,267 subcompacts were sold. That's Sonic, Fiesta, Fit, Accent, Rio, 2, Versa, Prius C, and Yaris. 58,121 minivans were sold. 34,520 Toyota, Nissan, and Honda pickup trucks were sold. Clearly this ain't 2004, when the Tahoe was America's third-best-selling SUV and the Expedition ranked seventh. But as the category grew smaller and smaller over time, and now surges to some degree, GM has not relinquished its control.